Brand USA – with British Airways and American Airlines – hosted a third annual MegaFam, or multi-itinerary U.S. familiarization trip, for about 70 UK travel agents in May 2015. After splitting into seven groups, each agent embarked on one of seven itineraries. The individual trips covered a total of 22 states. Following their six-night journeys, the agents convened in Philadelphia, for the MegaFam’s grand finale, where they shared travel experiences through group presentations. They also went sightseeing in Philadelphia before heading back to the UK. 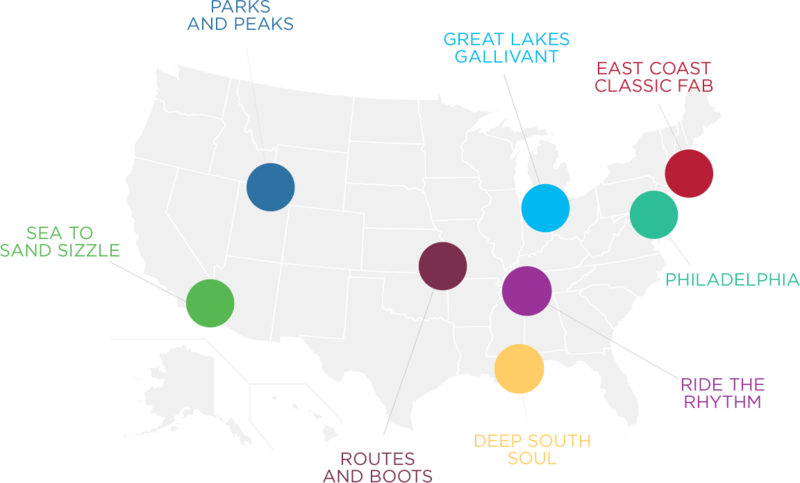 The seven itineraries were named: “East Coast Classic Fab,” “Great Lakes Gallivant,” “Ride the Rhythm,” “Deep South Soul,” “Routes and Boots” and “Parks and Peaks.” British Airways, which operates daily flights to the United States, highlighted Philadelphia as one of its U.S. hubs. They also competed in sales production, as measured by how many U.S. travel packages (using British Airways or American Airlines) they sold during the first three months of 2015.